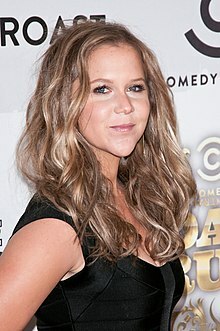 Amy Beth Schumer (born June 1, 1981) is an American stand-up comedian, writer, actress, and producer. She is the star of the sketch comedy series Inside Amy Schumer, which has been airing on Comedy Central since 2013. She starred in comedy movies Trainwreck and Snatched. ↑ "Amy Schumer". TV Guide. Retrieved April 16, 2015. This page was last changed on 23 March 2019, at 01:52.